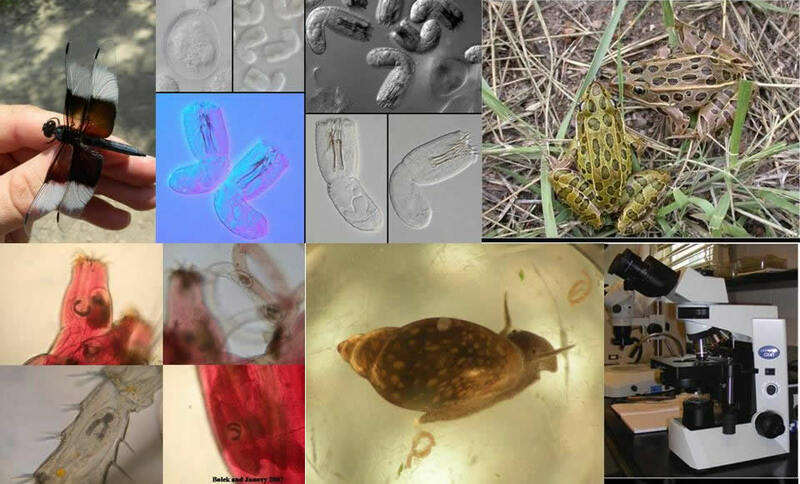 Our current work focuses on questions in parasite ecology and life cycle variation of helminth and protozoan parasites. From the host perspective, I utilize parasites of amphibians (anurans and caudatans) and invertebrates (odonates, crickets, and snails) in order to investigate questions on parasite ecology and evolution because lower vertebrates and invertebrates have invaded a multitude of micro-habitats and exhibit a striking diversity of life histories, however students in my laboratory can also work on similar questions using other host groups such as fish, and reptiles (testudines and squamata). From the parasite perspective I use groups of parasites that vary in their life-cycle complexity from one-host life-cycle parasites (coccidia, flies, and nematodes) to two and three-host life-cycle parasites (myxozoans, nematomorpha, and trematodes). I conduct field studies, laboratory experimental infections, and with collaborators we use molecular tools to ask general questions about parasite life histories, host specificity and ecology and evolution relationships of parasites. For specific types of questions being explored in the OSU parasitology laboratory see publications and current students. I am always excited to talk to students who wish to pursue their M.S. or Ph.D. in my lab, as well as to undergraduates looking for research experience. Students interesting in joining the Bolek parasitology laboratory for BS, Master’s or Ph.D. level research should contact Dr. Bolek directly at bolek@okstate.edu. Include in your letter information about yourself and why you are interested in parasitology and our work specifically. Please provide any additional information about your research background if any.